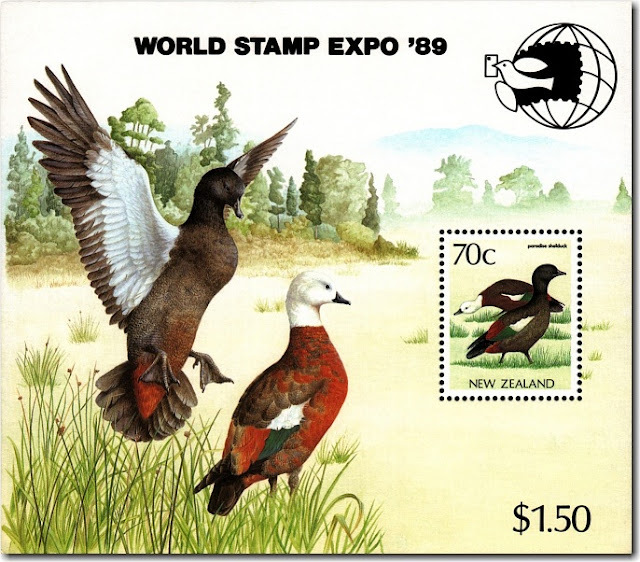 Virtual New Zealand Stamps: Late 80s Stamp Exhibitions. During the 1980s NZ Post was getting involved in a lot of international stamp exhibitions. The main driving force behind this was marketing and sales to the collector market so by promoting New Zealand stamps overseas, a greater demand was created for our stamps. 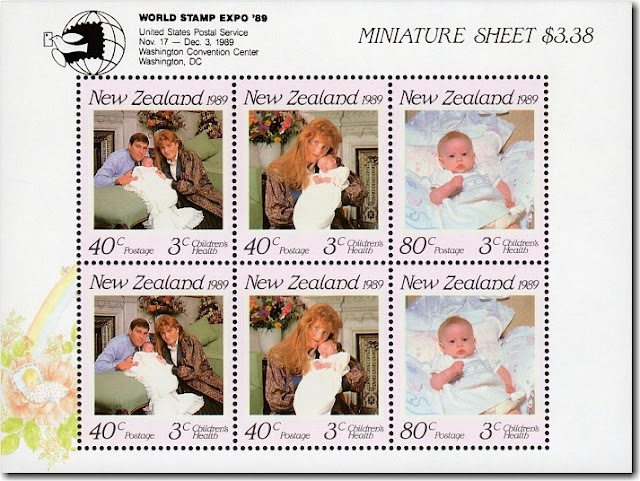 There was an NZ Post stand at each exhibition and in many cases, a special miniature sheet was sold too. Usually, this sheet was just a current issue sheet overprinted with the exhibition's name, logo and details but in a few cases, a special miniature sheet was created. This page has collected all of these special issues together so they can be compared and reviewed. Where possible, links will be provided back to the original issues appearing on these sheets. In some cases, you will find these special sheets are included with the original issues as well. We make no apology for this as it adds extra interest and greater depth to this blog. 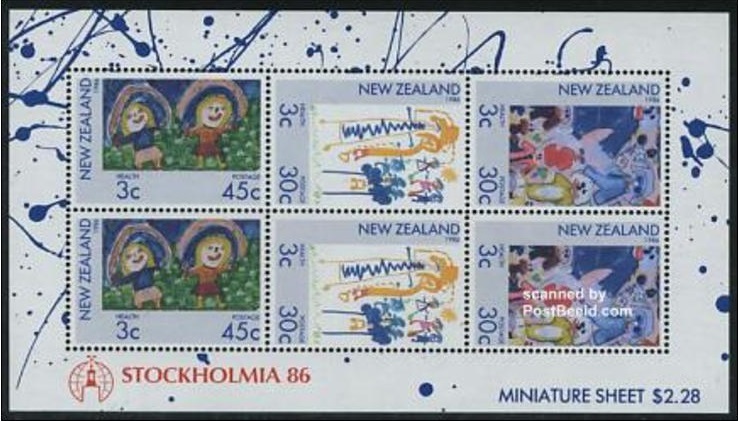 The 1986 Scenic Bays and 1986 Health miniature sheets were also issued with the Stockholmia '86 overprint to celebrate New Zealand Post's attendance at the Stockholmia '86 World Philatelic Exhibition in Stockholm, Sweden. Exhibition Miniature Sheet with one 80 cent stamp (Surcharged to support exhibition) 1990 World Philatelic Exhibition Auckland - Stockholmia '86 Overprint. See our post 1985 - 1986 Scenic Stamps. Health Exhibition Miniature Sheet with four 30 cent and two 45 cent stamps (Surcharged for health) - Stockholmia '86 Overprint. See Health Stamps - Part Three. 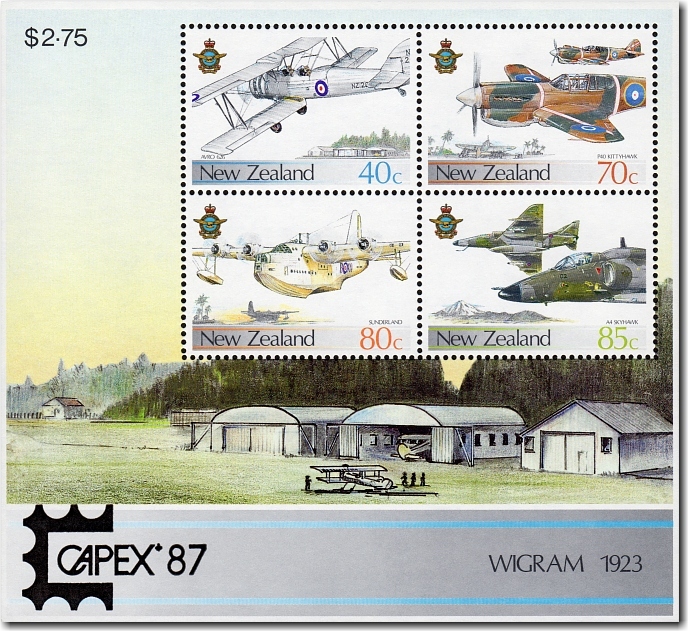 The 1987 Royal New Zealand Airforce and the 1987 National Parks Scenic Issue miniature sheets were issued with Capex'87 overprints to commemorate New Zealand Post's attendance at Capex'87 - the World Philatelic Exhibition held in Toronto, Canada from June 13th to the 21st, 1987. Royal New Zealand Air Force Exhibition Miniature Sheet with one 40 cent, one 70 cent, one 80 cent and one 85 cent stamp Capex '87 Overprint. 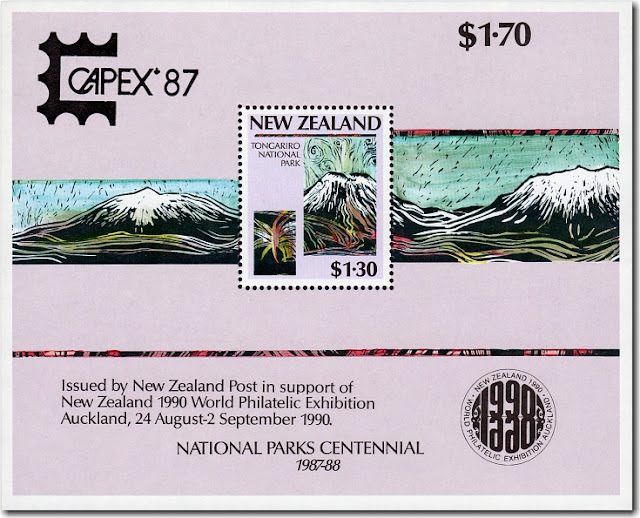 National Parks Exhibition Miniature Sheet with one $1.30 stamp (Surcharged to support exhibition) 1990 World Philatelic Exhibition Auckland - Capex '87 Overprint. See our Post 1987 - 1989 Scenic Stamps. The 1988 Centenary Philatelic Society of New Zealand Miniature sheet was overprinted for the Australian Bicentennial Philatelic Exhibition which was held in Sydney. 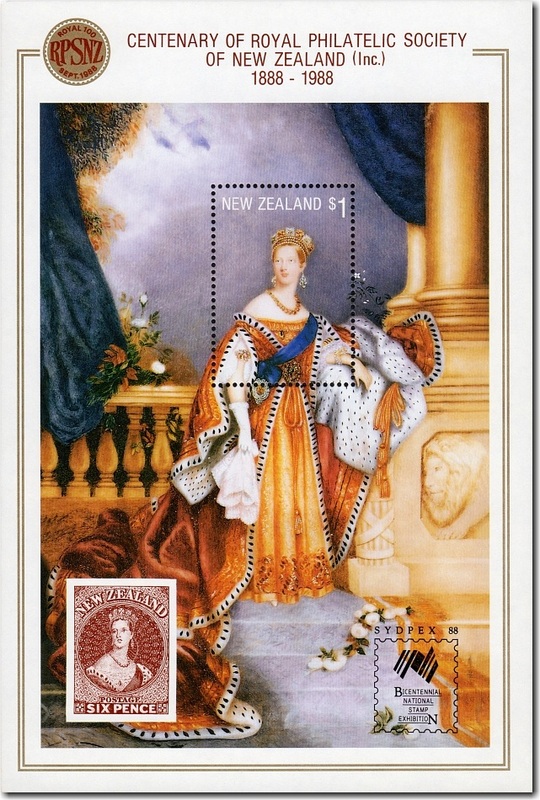 It was also overprinted with the Royal 100 logo for the Royal 100 National Philatelic Exhibition which was held in Wellington between the 6th and 9th of October, 1988. Centenary Philatelic Society Exhibition Miniature Sheet with one $1 stamp - Sydpex 88 Overprint. This is a painting by Alfred Chalon that inspired New Zealand's first stamp design the Full-Faced Queens of 1855. Notice the 6d shown that in the bottom left corner. See 1855 Full-Faced Queens - Part One. 1855 Full-Faced Queens - Part Four. 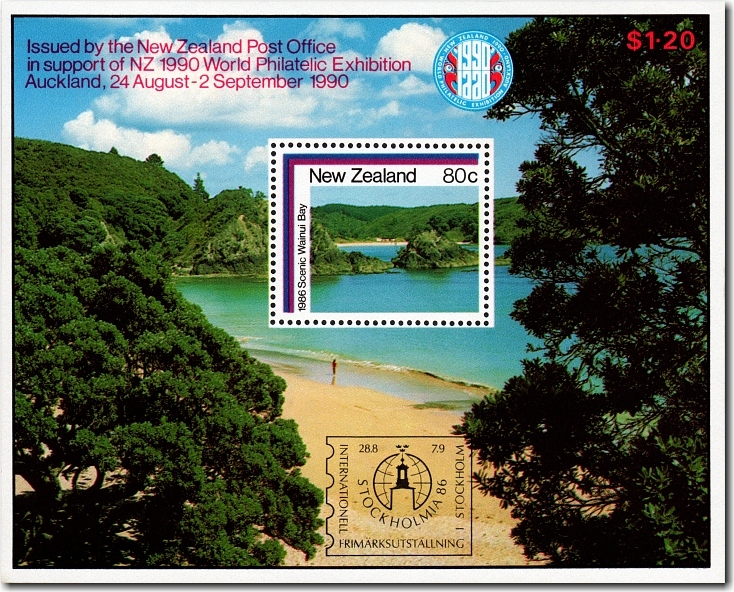 New Zealand Post attended the PhilexFrance '89 Stamp Exhibition in Paris in 1989. A special souvenir miniature sheet was produced to mark the occasion featuring the $2 Definitive black robin stamp. The sheet showed the three different colour separations required to produce the finished stamp. Philexfrance Exhibition Miniature Sheet with one $2 stamp surround with colour separations of the same stamp. 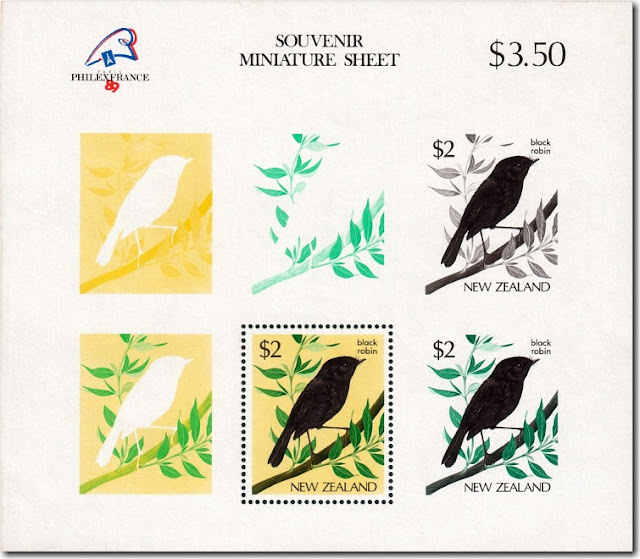 See our post 1985 - 93 Native Birds Definitives. These miniature sheets commemorate the 1989 World Stamp Expo held in Washington DC, America from the 17th of November to the 3rd of December 1989. World Stamp Expo '89 Exhibition Miniature Sheet with one 70 cent definitive stamp. Health Exhibition Miniature Sheet with four 40 cent and two 80 cent stamps (Surcharged for health) - World Stamp Expo '89 Overprint. Some Information or images for this post came from. 1996 Ross Dependency Antarctic Landscapes.